Web App Marketplace allows you to quickly deploy dynamic blogs, CMS platforms, e-commerce sites, and more, with ready-to-use Azure Web Apps and templates including hundreds of popular open source solutions by Microsoft, partners, and the community. 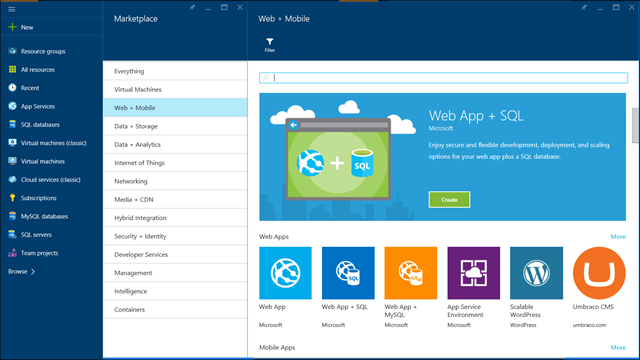 Azure users can create an open source solution by clicking on New -> Web -> From Gallery in the old Azure Management portal and in the new Azure portal using Web Marketplace. 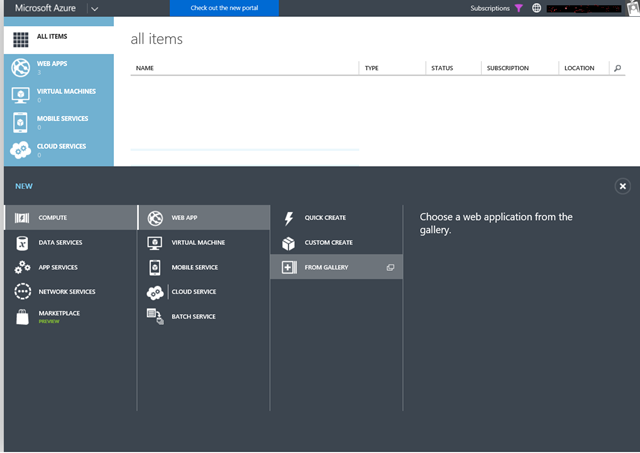 In an effort to improve the web apps user experience, we will no longer support the creation of Gallery applications from the old Azure Management portal, starting June, 2016. When you click on New -> Web -> From Gallery on Azure Management portal, you will be informed to use the new Azure portal. You can always access the Azure portal Web Marketplace by clicking here. Please share your feedback on how we can improve the Web Apps Marketplace and any new apps you would like to see in the Azure Marketplace on UserVoice .